Amongst its many extravagant qualities, Vero Beach is perhaps most known for its stunning oceanfront properties. The city is casually known as the “Gateway to the Tropics” for its climatically unique flora and fauna. Here, majestic oaks blend with verdant plants, and pine forests give way to lush, tropical flowers and foliage. Pair the landscaping with the serene blue waters of the Atlantic (not to mention the Indian River Lagoon! ), and you’ve got a recipe for resort-style living. Let’s travel up the coastline for an exclusive tour inside some of the city’s finest oceanfront properties, from luxury townhomes to opulent compounds. 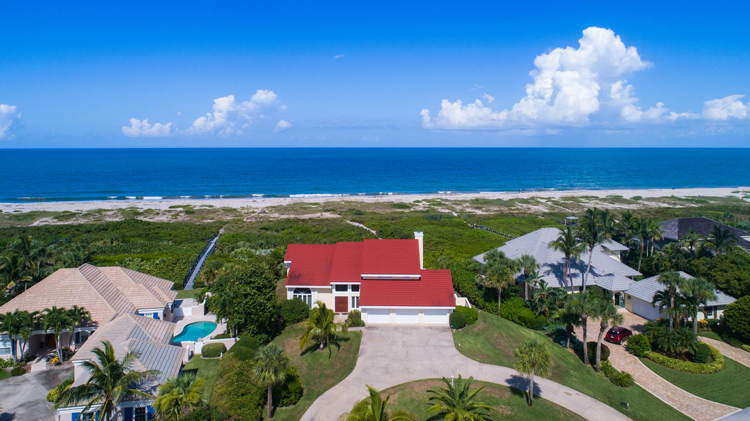 In addition to their unparalleled ocean vistas, these homes for sale in Vero Beach offer some of the region’s most desirable amenities. This significant oceanfront property in the Estate Section of Vero Beach is considered one of Florida’s great estates. Completed in 2018, this unparalleled compound features nearly seven acres of direct oceanfront land with a Great House as the centerpiece, in addition to a pool house, a guest house and a carriage house, all with significant outdoor living areas and garages for 10 cars. In total, the property has 12 bedrooms, 13 full bathrooms, and three half-baths within a grand total of 27,588 square feet. This new estate is one of Florida’s largest oceanfront properties by land. The gated compound pays homage to the famed villas of the French Mediterranean coast with authentic touches of the Côte Sud. This expansive property is considered one of the most extraordinary estates on Florida’s Treasure Coast. This spellbinding oceanfront paradise is situated in the charming village of Vero Beach just steps from the wave-lapped sugar sands. The brand new compound is designed for both entertaining and extravagant resort-at-home living. The 18,000-square-foot residence fronting 200+/- feet across the ocean has eight bedrooms and eight full bathrooms, plus four half baths. The estate connects with surrounding landscape in a seamless indoor/outdoor flow with floor-to-ceiling glass windows showcasing the property’s lush landscaping, the serene infinity pool and the expansive ocean beyond. Lush dunes give way to sugar sands and turquoise waters in the idyllic setting of this custom-built island-inspired residence, one of a select number of direct oceanfront estates in the sought-after Orchid Island Golf & Beach Club. Designed with a main home and companion guest house surrounding a gorgeous pool courtyard, this impressive six-bedroom residence was constructed in 2007 by The Hill Group, a high-end Vero Beach builder with a 30-year record of quality and integrity. Conducive to an effortless indoor/outdoor lifestyle, the great room joins the main living and dining areas together in one large open space, anchored by a fireplace, flowing outdoors to a relaxing oceanfront loggia. Featuring exquisite indoor and outdoor living spaces, this understatedly elegant oceanfront residence is embraced in a tropical paradise in Ocean Pearl, an intimate gated cul-de-sac enclave just north of John’s Island. Approached by a gated drive that winds through the gorgeous tree-cloaked landscape, the five-bedroom residence is a vision of timeless beauty designed by noted Vero Beach architect L.M. Silkworth P.A. and custom built by The Hill Group. The ocean’s aquamarine splendor is the focus of the graceful layout that opens virtually every room to the outdoors. An understatedly elegant gathering space by an inviting fireplace, the living room joins to the lounge areas around the perimeter-overflow pool, across from a romantic fire-lit pavilion, where the ocean’s sights and sounds give this resort-like setting the true feel of paradise. This brand new modern showplace is nestled in Vero Beach’s coveted Estate Section amongst estate homes that have sold for over $20 million. The property boasts impeccable design, high-end luxury finishes, and state-of-the-art technology — plus access to the ocean just steps away. A private drive leads to the main residence, with enchanting tropical foliage at every turn. Exquisite millwork and stone finishes refine the clean lines of the comfortably elegant living environment, at once timelessly classic and freshly stylish. Whether as an idyllic escape from the everyday world or a convivial gathering place for family and friends, this oceanfront gem is simply sublime. This oceanfront paradise surveys its tropical surroundings from high above the dunes at The Estates of North Shore, an exclusive new gated enclave containing seven oceanfront properties. Resort-at-home living is the focus of this lavishly upgraded five-bedroom compound created by luxury waterfront expert Coastmark Companies in collaboration with architect Jeffrey Ray, AIA, head of the boutique firm Atelier d’Architecture. Meeting the highest standards with its exquisite design, masterfully engineered construction, and leading-edge innovations, this oceanfront showplace is an effortless blend of beauty and livability. This exquisite compound-like estate was custom built in 2014 by Helmet House Construction, an award-winning family-owned local firm with a long-standing reputation for high quality and attention to detail. It is situated directly along the ocean in the heart of activity in Vero Beach, within walking distance of fine boutiques, restaurants and beachfront resorts. Just beyond the estate’s arched entry, the sparkling blue ocean is seen from the comfortably elegant living room and the family room, open to the chef’s kitchen. Glass doors connect these rooms to outdoor lounge areas by the infinity pool accompanied by beachside lawns with a putting green, leading to gated access for a stroll along the sands or a swim in the sea. These outdoor areas provide a personal resort-like oasis with the privacy and comfort of home. Traditional design blends with modern comfort in this spacious three-story estate. A peaceful paradise for the beach and boating enthusiast, Ambersand Beach sits on the pristine barrier island just south of Sebastian Inlet Park where the Indian River meets the Atlantic. Inside the mahogany entrance of the marble foyer, the sparkling expanse of the ocean is seen through the coffer-ceilinged living room with its inviting coral-stone fireplace. A luxurious sanctuary enjoying the space and privacy of the entire upper floor, the master suite captures sweeping ocean views and sunrises from the window-walled bedroom, open sitting room, office, and marble bath with soaking tub, shower and dual walk-in closets. This direct oceanfront estate is situated on the wide dune-fringed sands of Castaway Cove, a desirable guard-gated ocean-to-river community offering Old Florida tranquility. Tastefully renovated as a luxurious beach retreat, this nearly one-acre oceanfront estate is tropically landscaped for privacy while providing a wide-open ocean vista. Backdropped by the idyllic Atlantic Ocean, the breezy full-length patio is perfect for relaxing by the free-form heated pool with spa, served by a cabana bath. The fresh and airy interiors are set off by richly finished millwork adding a comfortable British West Indies feel. This airy and unique property is nestled along the ocean in Seagrove East, a guard-gated community just a short drive from the village. Comfortable, open living spaces are at the heart of the property, enhanced by airy beamed cathedral ceilings, gorgeous Polynesian shell-stone floors, and glass doors open to relaxing outdoor spaces. A restful retreat, the private oceanfront master suite has the luxury of two separate baths accompanied by generous closets. Opening to its own deck and served by a kitchenette, the ground level features a guest suite with a sitting area and half bath. This luxury townhome offers both a relaxing oceanfront retreat and convenient proximity to Vero Beach’s charming village, containing wonderful beachside restaurants, shops, and luxurious resorts. This is one of just five townhomes that comprise the intimate gated enclave beautifully designed by architect Gregory Anderson and custom built to superior standards by Water’s Edge Estates. Looking out over the endless ocean, this exquisite townhome centers on a private pool courtyard between the main house and separate guest house above the two-bay garage. Fresh coastal style is refined with a designer look in this picture-perfect residence appointed with fine finishes in a muted palette inspired by the sands and sea, featuring stone and hardwood floors, architectural millwork and impact-glass windows. Still searching for your dream oceanfront property in Vero Beach?